What do you get when you combine twin stick shooting, bullet hell style dodging and a Saturday morning cartoon? Apparently, you get an overly-confident female android pilot named Cactus! Despite being available on other platforms for a while, Assault Android Cactus is releasing at an exciting time for Xbox One owners. Choosing to release the same day as Microsoft’s new console is bold, but developer Witch Beam has made it worth your while with Xbox One X enhancements. While I know it is tempting to overlook indie games around this time of the year, I highly suggest you don’t. 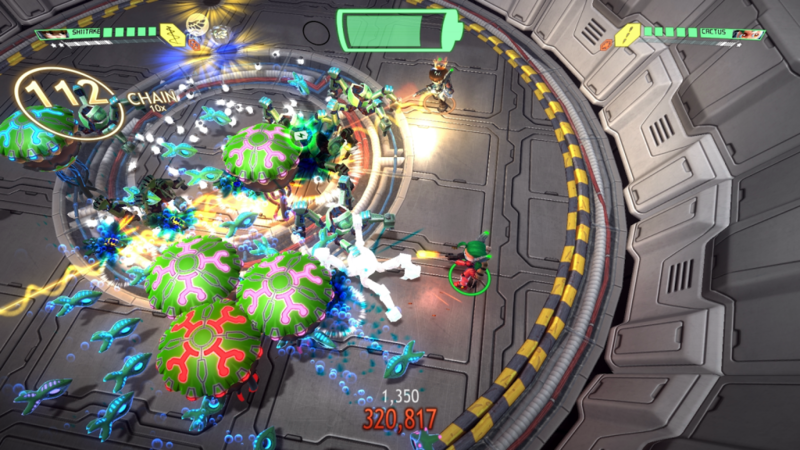 Assault Android Cactus is a heart-pumping shooter that deserves your time as much as anything else this fall. While making a routine flyby a civilian freighter, Cactus suddenly found herself dodging laser cannon fire. Rather than abort her mission and deal with pesky paperwork, she decides to fight through against the wishes of her commander. Unfortunately, she crashes and suddenly finds hundreds of thousands of problems. The robot work force among the ship has gone awry, attacking the androids who also called that ship home. The only way to regain control is to fight their way to the core and get it back online. The journey to regain control takes Cactus and her friends through many different indoor industrial areas, killing robots and bosses along the way. The story is delivered through nicely animated and voiced cut-scenes and frankly, I don’t need much more motivation than that to blast some robots. 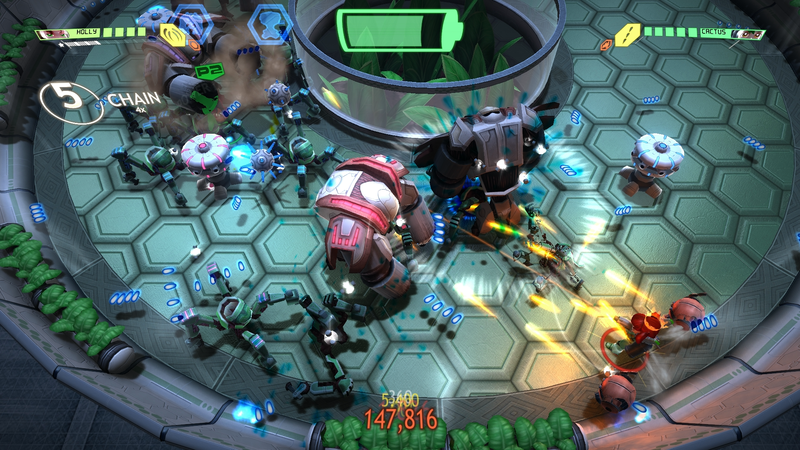 What makes Assault Android Cactus most unique is its battery life mechanic. Rather than starting a level with a few extra lives, you have a battery bar that slowly decreases. Destroying enemies causes them to drop ability items and extra batteries, which recharge your meter and allow you to go on. If you are overcome by the enemy, Cactus will fall to the ground and you must resurrect her by tapping the right trigger rapidly. The beauty of this system is that getting knocked down doesn’t always mean you will fail. There were countless moments where my battery was teetering towards depletion and I picked up a recharge in the nick of time. These moments add tension and excitement to the gameplay and makes Assault Android Cactus feel much faster than most twin stick shooters. Aside from batteries, enemies drop small white orbs that will upgrade your weapon in stages, if you don’t get knocked out. Staying alive and killing enemies quickly increases a combo meter, which has an attached multiplier which contributes to your overall score. A few useful items will also appear after dispatching enemies, these include a shutdown item which acts like an EMP grenade, another temporarily increases your firepower while the accelerant increases your movement and shooting speed. If you leave an item alone it will gradually change into one of the three versions, adding more strategy. Cactus and her friends also have a strong alt-fire weapon that can be toggled by pressing LT, but it does not last long. The weapon loadouts, aside from the character models, are what really separates the playable android characters from one another. Thankfully I could use any one I wanted for whatever challenges each level posed. After completing a level, you will be given a final score and letter grade, in addition to showing your place on the leaderboards. I enjoyed the accessibility of being able to beat a level but there is a legitimate challenge there for players who are interested in S+ rankings. The shooting action is incredibly fast, but I never once felt like I was out of control. While I was sadly only playing the non-enhanced version, I had no issues when it came to smoothness or fluidity. The combination of constant enemy spawns and the upbeat soundtrack really immersed me in the game. I mentioned earlier that there is a nice variety of characters, each with their own unique personality and weapons loadout. I would have preferred a bit more variety in the environment locations and a few more enemy types would not have hurt. There is local multiplayer support for up to four players, but sadly no online multiplayer. I enjoyed the variety of each boss fight, but some characters are better suited against particular bosses than others. 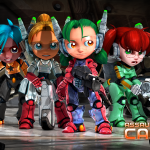 I was pleasantly surprised by some of the extra modes included in Assault Android Cactus. The codex gives information about basically everyone in the game along with an art gallery, pretty standard inclusions. It was the discovery of unlockable EX options like little head mode, first person mode, AI partners and more that added some diversity to gameplay. These modes must be unlocked with credits you earn by playing, encouraging replay value. Just be aware that using some of these options can negate any high scores for leaderboard purposes. Rounding out the extras is a jukebox and sound test mode where you can listen to the audio of Assault Android Cactus at your leisure. Infinity drive and daily drive modes are also available from the get-go, in addition to the normal campaign. Daily drive is a typical daily run mode where you set out to reach the highest score on the leaderboard for that day. Infinity drive is basically and endless horde type mode. Both are nice additions that only help round out this package and will keep you coming back. Developers who take care gamers deserve to be rewarded in return. 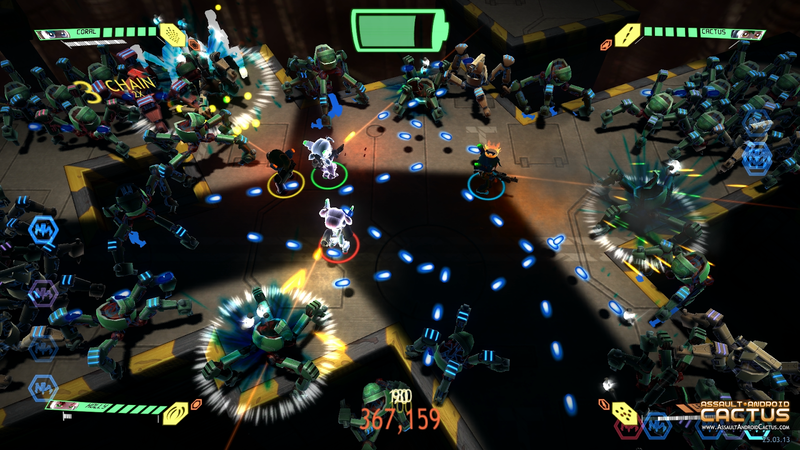 The team behind Assault Android Cactus delivered on an Xbox One version and put in the extra work to add enhancements on day one of Xbox One X. 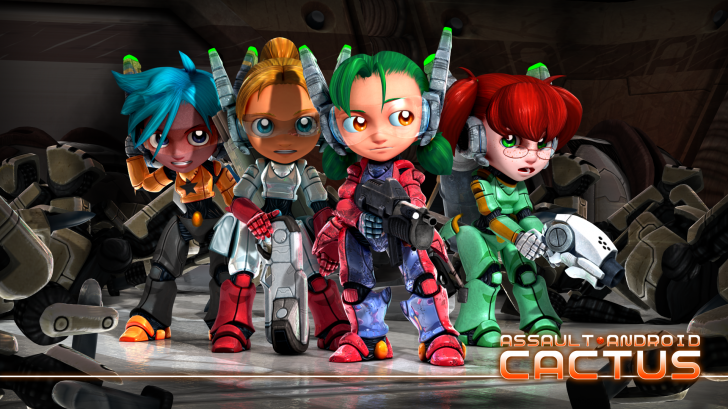 There are many qualities that separate Assault Android Cactus from other games in the genre. I could mention the controls that feel so natural and smooth, the upbeat soundtrack that perfectly blends with the rapid-fire gunplay. A bevvy of modes, enhancements, characters and most importantly…fun are all there waiting for you in beautiful 4K. I’m happy to report that the game is family friendly and there is even a free trial available. Xbox One X owners owe it to themselves to experience Assault Android Cactus in motion, at the very least.